Cortana-powered GLAS will run on Windows 10 IoT Core, and looks to appeal to energy-efficient businesses. 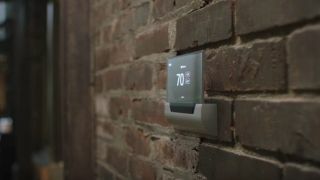 Microsoft has announced its entry into the smart office market with the launch of a new smart thermostat. GLAS, which was revealed in a YouTube video today, targets businesses and stores looking to establish a smarter, more connected workplace. Developed in conjunction with Johnson Controls, the device aims to offer a more energy-efficient way to monitor temperature, as well as provide real-time information on energy usage and air quality, and even show off your upcoming calendar information - such as who has a meeting room booked next. Similar to the likes of Google's Nest or Hive from British Gas, GLAS will be able to be controlled from your smartphone via a companion app, but also features a glass touchscreen which allows users to directly interact with the device. But GLAS also comes with sensors that will detect when someone is in the room, and adjust its settings accordingly, meaning savings for you and your organisation. GLAS will run on Microsoft's specialist IoT software - Windows 10 IoT Core, and will also come with Cortana's voice recognition system included, meaning you should be able to control the device using voice commands. This is all supported by Microsoft's Azure platform, which could mean future improvements based on crowdsourcing of user information. First announced in 2015, Microsoft has been vocal about using Windows 10 IoT Core to power the next generation of smart home and smart office products, with the company previously saying it hopes to include the software and Cortana to items as diverse as fridges or toasters.